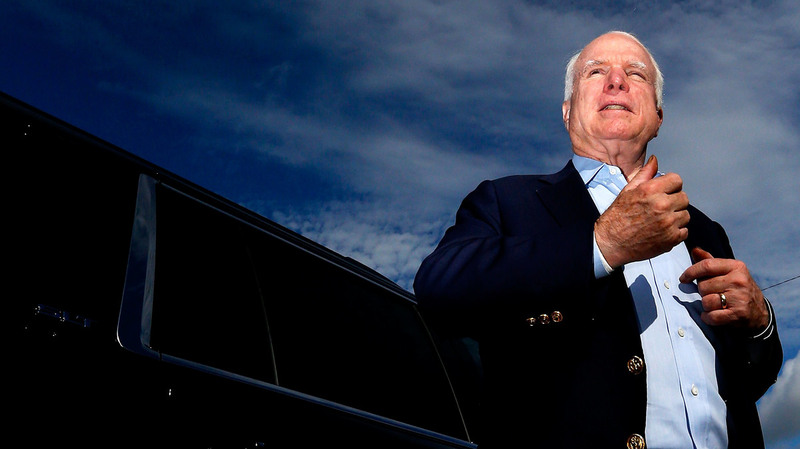 John McCain's Death Marks The Near-Extinction Of Bipartisanship The Arizona Republican was known for reaching across the aisle when big things had to be tackled. The number of lawmakers willing to do that now is dwindling. Sen. John McCain, seen in 2014, told his Senate colleagues last year: "I suspect they'll find we all conspired in our decline — either by deliberate actions or neglect." The death of John McCain represents something more than the death of a U.S. senator and an American military hero. In this hotly partisan era, it also symbolizes the near-extinction of lawmakers who believe in seeking bipartisanship to tackle big problems. "[O]ur arcane rules and customs are deliberately intended to require broad cooperation to function well at all," McCain said in July 2017, with a cut over his eye from treatment for brain cancer, speaking of Senate rules. "The most revered members of this institution accepted the necessity of compromise in order to make incremental progress on solving America's problems and defend her from her adversaries." McCain was a conservative. But he earned his "maverick" reputation because when it came to seemingly intractable problems, like immigration and money in politics, he believed it was necessary to work with the other side — even if it meant bucking his party. "The thing that I continue to think about is his love of politics," said Pablo Carrillo, who worked for McCain for 15 years, including as his chief of staff from 2013 to 2017. "The phrase that has been used occasionally about him has been 'the happy warrior.' I absolutely agree with that." That love of politics was also rooted in a belief that politics is the art of the possible. It's why he sought out friendships with Democrats, from Joe Biden to Ted Kennedy to Hillary Clinton. It's a view that is looked upon as quaint or even naïve today when lawmakers on the other side of the aisle are turned into caricatures and voters are more likely to punish politicians for being too close to someone of a different political stripe. But it made government work, and McCain believed in it. "Incremental progress, compromises that each side criticize but also accept, just plain muddling through to chip away at problems and keep our enemies from doing their worst isn't glamorous or exciting," McCain said from the Senate floor last July. "It doesn't feel like a political triumph. But it's usually the most we can expect from our system of government, operating in a country as diverse and quarrelsome and free as ours." 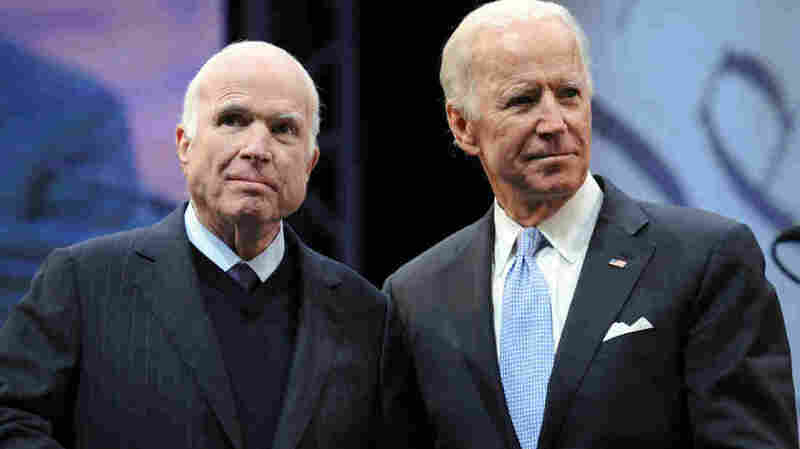 Sen. John McCain, R-Ariz., receives the the 2017 Liberty Medal from former Vice President Joe Biden in October 2017. 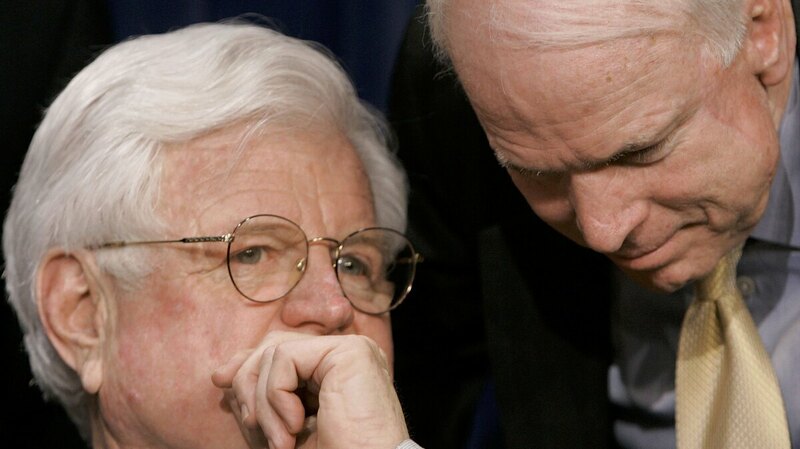 McCain sought out friendships with Democrats, from Biden to Ted Kennedy to Hillary Clinton. That's a tough case to make when sweeping panaceas are more en vogue on the campaign trail and when "compromise" is increasingly seen as a dirty word. "I reject the word," the future Republican House Speaker John Boehner told CBS' 60 Minutes after the 2010 election. His party had just ridden a Tea Party wave to power, a wave that was fueled by an unyielding core that wasn't interested in compromise. Boehner added: "When you say the word 'compromise,' a lot of Americans look up and go, 'Uh oh, they're gonna sell me out.' And so finding common ground, I think, makes more sense." That same group Boehner was trying to placate eventually led to his ouster. Senate Republican leader Mitch McConnell is no friend of the Tea Party. He actively worked against its candidates in the last several elections, because he thought they couldn't win — and that they cost him seats. Just how many is that? Consider that before 1971, the number of cloture motions filed never once was higher than seven for any session of Congress. But the lack of bipartisanship is not all about Republicans. Using the filibuster as a way to thwart the party in power is a practice that was normalized by then-Democratic Senate leader Harry Reid during the George W. Bush years. And while Democrats have traditionally been more likely to believe in the importance of compromise over sticking to beliefs, even that seems to be changing. 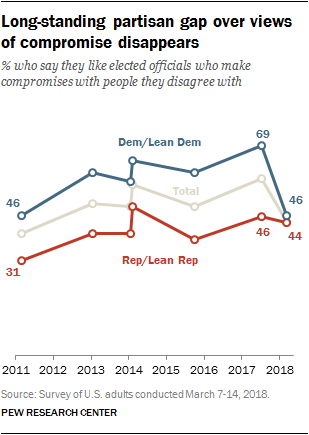 Pew found in a survey in April of this year that the longstanding gap on compromise had completely disappeared since July 2017. Whether that's a short-term product of opposition to Trump or an indication of something bigger is not clear yet. But progressives have grown increasingly frustrated with Democratic leaders. The energy in the party isn't with centrism, it's with the economic populism of independent Sen. Bernie Sanders and congressional candidate Alexandria Ocasio-Cortez. The progressive wing has, in many ways, changed the narrative on the left — and younger candidates are far less compromising. Where that leads, no one knows for sure yet. But the results are already being seen — the shutting down of the government, a lack of productivity and a level of acrimony and partisanship that is as high as it has been than at any time since the Civil War. "I think that the political environment today is dominated by a desire to win," Carrillo said. "And I think that some of the most dynamic leaders have been those who have seen politics as a way of addressing ideals that are broader, that exceed one's mere self-interest. And I think that there's been a change in that regard." It's not just legislating, though, it's society. Americans have sorted themselves by everything from place to their a la carte consumption of news and social media to even whom they want their children to marry. From 1994 to 2014, the number of Americans who said they are consistently conservative or consistently liberal doubled, according to the Pew Research Center. And more people are going so far as to say the other party's policies "threaten the nation's well-being," Pew also found. To put it plainly: Nothing divides Americans like politics — and it wasn't always that way. One explanation for why partisanship has gotten as bad as it has is that lawmakers feel pressure to get home to their states and districts. They don't stick around Washington, D.C., to get to know one another on a personal level as much anymore, more easily reducing the other side to caricatures. During her time in the Senate, Hillary Clinton became friends with McCain. They traveled together and got to know each other. They even engaged in a vodka shots contest together in a now-famous 2004 trip to Tallinn, Estonia. "I would not take credit for it," Clinton told CNN on Sunday. "I think it was a mutually agreed-upon venture, but we used to say, 'What happens in Tallinn, stays in Tallinn.'" Clinton revealed something more, however. "During those long, long flights," she said, "we had a lot of time to talk. We talked about the unfairness that sometimes infects our politics. If you were his friend, he would stand up for you, he would defend you. He didn't like the personal attacks that went along with politics that became increasingly common." Sens. Ted Kennedy of Massachusetts and John McCain of Arizona, talk during a news conference on their effort at a comprehensive immigration overhaul in 2006. But voters aren't rewarding that kind of across-the-aisle relationship building. Quite the opposite. Becoming part of Washington and embracing the other side has cost more than one elected official their job. McCain wasn't perfect. He often acknowledged as much. He could be temperamental, and some would argue his grudges would sometimes affect his politics. He was against the Bush tax cuts before he was for them; he voted against the 2009 stimulus, calling it "generational theft"; and he famously thwarted Republicans' repeal of the Affordable Care Act with his middle-of-the-night thumbs-down, even though he voted against the original health care bill. "Let's leave the history of who shot first to the historians," McCain said in that speech to colleagues last year. "I suspect they'll find we all conspired in our decline – either by deliberate actions or neglect. "We've all played some role in it. Certainly I have. Sometimes, I've let my passion rule my reason. Sometimes, I made it harder to find common ground because of something harsh I said to a colleague. Sometimes, I wanted to win more for the sake of winning than to achieve a contested policy." But for all of McCain's flaws, even Democrats regarded him as a good-faith negotiator who believed the country was better off when leaders in the two parties could hold hands to try to accomplish big — and potentially divisive — things together. And that is in short supply today in the zero-sum game of what our politics have turned into.